Photo by: OscenseWhen I arrived doors weren’t opened yet, I thought I was catching a pneumonia waiting in the wind this way. When they finally opened the doors, I was happy to finally find some heat.I had bought my tickets for the D row so I thought I would be on the 4th row, but I was at the second row in the end, just like the day before, just perfect! Perfect except that rows were really too small, not large enought, we couldn’t even spread our legs! Ben Taylor’s set was great, but the sound quality and audience quietness wasn’t in the place as the day before in Edinburgh. People couldn’t stop going to the bar and buy some beers, beers, beers, beers, ice cream, beers. Of course it came that during the show they all went to the toilets (some went there several times!). Why paying a concert ticket £28.50 and only enjoying part of it? This I’ll never understand I guess, plus the fact that having dozens and dozens of people walking in front of you as you’re trying to enjoy the show is really annoying. – Sound quality wasn’t as good :( There was a technical problem at some point, Tracy’s pedal or so, that made them change the setlist, they were about to play Don’t Dwell but it didn’t want to work. As the audience began to get impatient Tracy sent Joe and Quinn to backstage and sang Behind The Wall. Then they played a really interesting version of House Of The Rising Sun (while the roadie was fixing the problem at her feet) and then once back they played Don’t Dwell. – They played Mountains O’ Things, House Of the Rising Sun, Before Easter and Come As You Are (instead of Subcity, Be and Be Not Afraid and Lean On Me). – When someone shouted “We Love You” Tracy told us they love us more than we love her, yeah? I honestly don’t think so! – Tracy wasn’t as talkative as the day before, we’ll never know if she enjoyed her short stay in Manchester. Outside the guy who was selling fake t-shirts brought his friends with him and this time they had more tees and even hoodies. I don’t why prices were from £7 to £10 this time. Stephen Langstaff: Tracy Chapman is a delight to watch. She walked into the middle of the dimly lit Manchester Apollo stage with grace, began a slow, jangling intro to ‘Why?’ and pulled everyone into her warm musical world. She then went quickly into ‘For My Lover’, and the sound of her beautiful voice mixed with the humming chorus of the sell-out crowd singing with her word-for-word, sent a shiver up my spine. The tone was set and the standard and power of her performance didn’t stop.She played a mixed bag of songs but seemed to particularly play songs from her first album, and quite a few from her latest album.There was a technical problem quite early on, perhaps with one of Tracy’s guitar pedals or their connections, and so there was a gap for about a minute or so, which was filled by various audience noises and shouted requests for songs and declarations of love. After ‘For My Lover’ had actually shouted out “We love you Tracy” to which she replied “We love you too”, to which someone else in the audience replied “We love you more”, to which Tracy concluded “Well, you have us beat on numbers so it’s possible that you do love us more”. Very cool, very funny. Anyway, the gap caused by the technical problem was quickly and wonderfully bridged when Tracy reshuffled the set, and swooped into the poignant a capella ‘Behind The Wall’. Another spine tingling moment, and the class and calm with which she dealt with the technical problem was great to watch’Don’t Dwell’ was really strong, and I thought ‘Say Hallelujah’, was a great song to follow it, because the change in mood was great. During ‘America’, Tracy had what looked like two tom drums set up either side of her, which she alternated playing with electric guitar. The lighting for this song was great with her silhouette being projected onto a large white screen behind her. It worked so well, and added a visual strength to what was a rip-roaring live version of the song. ‘The Promise’, was played alone by Tracy on the acoustic and was one of those “you-could-have-heard-a-pin-drop” moments. ‘Another Sun’ was a slightly reworked version of the song, which I felt, what with the smooth, grooving sway of the electric guitars and the percussion really pushed the song to it’s outer reaches. Yet another spine-tingler for me.Both ‘Come As You Are’ and ‘The House Of The Rising Sun’, were gorgeous cover versions, and the very last song, ‘Give Me One Reason’ really got the crowd stirred up, with various pockets of the audience standing up to dance. At the end of the night, Tracy Chapman and her band had received two standing ovations and from what I saw and heard on the way out of the venue left the crowd glowing and moved. As another friend of mine has said to me in the past about Tracy Chapman voice: “when she sings, it’s like you can hear her soul”. I think that sums up the feeling of seeing her live really well. She is a delight to watch. Not that it took away from the concert one little bit, but at the end of the night near the stage door, a few people were waiting in the hope of getting a quick autograph off the woman herself. I waited there with three friends and the weather was a bit drizzly to begin with but at one point the rain just started pouring down. The crowd dispersed slowly as the rain got heavier, leaving only a few people waiting. By that time it was a case of “oh well we’ve waited for a while already, we might as well hang on, she should be out soon”. Anyway to cut a long story short, after all the crew had loaded up the equipment and the staff had watched those of us who were waiting getting rained on for just under an hour, a short, fat man with a moustache, I’m not sure whether it was a member of the tour crew or someone who works for the Apollo, sneared at us and said “She’s gone you know”, and then sarcastically added “You know there was a black coach down the road? Well it’s not there now, so she gone”. Now, I know that he and the all the crew had a job to do, but nobody was stopping him from doing it so there was no reason for his aggressive attitude, and if he knew people were stood in the rain for no reason, then what would it have cost him or someone else to say something? I hope I don’t sound like a disgruntled, overzealous fan all upset because I never got an autograph. I just thought it was a bit of a pathetic attitude in that little man who spoke to people disrespectfully for no reason. Anyway, after an uplifting gig like that, a little soaking was never going to dampen anyone’s spirits. Let It Rain! Tracy was playing with quite a stripped down 3-piece (guitar-guitar-drums/percussion) set up, herself alternating between acoustic guitar and electric, and her lead guitarist shifting between guitar, bass and organ. The touches and playing style of her guitarist complements the songs really well. I know that in interviews prior to the release of ‘Where You Live’ Tracy spoke about a change in dynamic for her on the album, and I think that that change in dynamic has translated wonderfully into her live performance. The atmosphere created by Tracy and her band was very natural, emotionally intense and at various times, really arse-kicking. A friend of mine who had never seen her before said that it was not so much like what you would call ‘normal’ entertainment, but like a kind of soul searching. And that is something that separates Tracy Chapman from most other artists that you see live. The level of vulnerability and strength she has in opening up when she sings to you blows me away. As long as you open up to what she’s giving you, her music is mesmerising and very soothing for the soul. Stefan Evans: Tracy Chapman Speaks the word that precedes bliss!! 7.30, and we arrive, the doors open and we go in, pretty simple!Half an hour later and we have bought T-shirts and a Jacket, absorbed the ambience of the most Chapman fan’s in one room you have ever seen before and it’s in to watch Ben Taylor play. His solo, mellow set was impressive (that his praise toward Tracy) makes me think he will do well. After his 30 minute set he told the audience he would be signing, after the show, so I took my Tracy Chapman painting/banner (which I made the day before) and went to “make a deal”. I asked Ben if he could sign it and when he agreed, I asked him to take it back stage and get Tracy to sign it too. So he agreed and took my work of Tracy inspired art and left. Ticket signed by Ben Taylor for Stefan EvansTracy’s set was about to begin! Nothing in my (as of yet) relatively short life, has ever made me so excited about anything than the immense joy of being literally 5 rows from the stage and seeing Tracy emerge in all her glory from behind the stage. – Why? (a great start and the crowd loved it, nice change in vocal style on this track than the cd version). – Chat – (Tracy replied to shouts of “I love you” with “I love you too” then to the reply “we love you more” she suggested person for person we have the numbers but none the less she adores her fans! Then she giggled at the excitement of the crowd as she let us know, “I have a new record, it’s called “Where You Live” and I will play some songs from my new CD tonight and some of my old songs”. Also, she explained, along with her today where “Quinn” the drummer and “Joe Gore”, the Bassist. (But You already knew that didn’t you). – Before Easter (pretty similar to the album version, but slightly slower. One of “Where You Live”’s best tracks in my opinion, loving the intro). – America (on came the hand drums and I knew what was up next, the spotlight shone onto Tracy and a HUGE silhouette engulfed the rear walls, Tracy hit the drums as Joe Gore and Quinn jammed behind her, then half way through the spotlight faded and Tracy took to her trusty guitar). The space between end of primary show and encore seemed like hours! But after many people took to their feet to join the chant Tracy, Tracy, Tracy, Tracy, Tracy. It was obvious she just had to come back on. At that point I though the night couldn’t get any better, well I was wrong, I left the show and headed towards the lobby, where, as promised awaited my painting/banner, signed by Ben Taylor and Tracy Chapman herself! I Literally had, “no words to say, no words to convey these feeling’s inside I have” for this gift! Thanks Ben, Thanks Tracy. The Show was amazing! I won’t forget that in a while. Nat: I saw Tracy Chapman last night in Manchester Apollo( 7th November). I’d like to say she was absolutely AWESOME!!! Her music was phenominal. The venue was also really small which made it even better. She played a lot of her well known songs aswell as some new ones, which were also great. The crowd was really energetic and at the end of the evening people were standing up and dancing to the last 2 tracks.I waited after the event at the stage door waiting for her to come out. However, my friend was waiting in the car for me so after a while I thought I was being unfair so went into the car and went home. Be interested to hear some other peoples opinions on what they thought of the night (or anywhere else she has played). Alison: As a very new Tracy Chapman fan (having been ‘educated’ by my boyfriend) I didn’t quite know what to expect from the show last night but am just in awe that such a beautiful voice can come from such an unassuming character. She was absolutely amazing, from the first note to the last – you could hear a pin drop. Even the slight technical issues (which we didn’t even notice) didn’t detract as she sang a cappella until they were fixed – one of many times my jaw hit the ground. I’m still raving about it to all my friends and colleagues. There was a real mix of old and new and it all sounded great – can’t wait for the next tour! [singlepic=723,95,142,left] THE Manchester public were presented with a quandary last night – should they plump for the unpredictable Dubliner Sinead O’Connor or the media-shy Tracy Chapman from the city’s a la carte gig menu? Not an easy choice. Both are outspoken, socially aware, charismatic and perhaps most importantly, possessors of two of the finest females voices of their generation. Owing to fond childhood memories of the latter’s self-titled debut album, I decided to fulfil a long-held desire and catch the Ohio-born songwriter in the flesh. Now 41, it’s been a long time since Chapman was big business on these shores, in fact the cry of ‘Free Nelson Mandela’ was the political chant of choice when she was last headline news here, thanks to her acclaimed appearance at 1988’s Amnesty International’s show at Wembley Stadium. Not that she had any problems packing out the Apollo last night though, with fans ranging from 16 to 60. I guess it doesn’t matter whether you are Tracy Chapman or Oasis – if you make a truly great debut LP fan loyalty is just one of perks. Thankfully, like Oasis, in the intervening years Chapman has also managed to beef up her back catalogue with some more exemplary material. She is here on a mammoth 38-date world tour to promote her seventh studio offering, Where You Live, which as Chapman hinted in her synopsis of the record, (‘a reflection of home, place, love and memory’), is as personal and thought-provoking as ever. Expertly supported by a virtuoso guitarist and a world music-style percussionist, the contemplative, life-affirming album opener Change proved sublime, while Don’t Dwell coupled with some subtle and stark lighting was both sultry and hypnotic. Any thoughts her casual, yet concentrated approach might have been upset by a mid-set sound glitch were quickly banished as well. As, following a brief tête-à-tête with her musicians, who quickly vacated the stage, it proved an opportune moment to deliver a spine-tingling rendition of her distinctive a capella take on domestic violence, Behind The Wall. Of course it was the holy trinity of Fast Car, Baby Can I Hold You and Talkin’ Bout A Revolution that sated most fans palates though – executed wonderfully with controlled passion amid a barrage of ‘we love you Tracy’ reposts. There was still time to spike up her political feathers and take a pop at the current US administration too with America. As now on Tom Tom-style drums as well as lead guitar, she pondered her home nation’s desire to continue conquering others haunted ‘by the ghost of Columbus’. Still special, still unique. Sinead or Tracy? On last night’s form I chose well. Tracy Chapman has blown a fuse. She stands in darkness while electricians scurry around to fix the problem. Suddenly, taking an acoustic guitar, she stands without a spotlight and launches into the Animals’ House of the Rising Sun. It seems an unlikely cover until the significance of the words hits home – “There is a house in New Orleans …” Chapman has turned an awkward personal moment into a comment on a natural disaster that has brought crisis and political uprising in America. No wonder everyone in the house is soon bellowing out cries of “Tracy! Tracy!” The hits and million-selling albums are gone now – in the UK, anyway – but the Cleveland, Ohio singer who grew up amid racial segregation retains a large constituency and a strong voice. That voice is unexpectedly powerful live: stark, haunted yet warmly human. Change – from her latest album, Where You Live, in which a lovely melody is allied to the striking words, “If you knew that you would die today … would you change?” – is stunning. Chapman has struggled to reinvent the image of her as the acoustic-wielding tender warrior who debuted Fast Car to global impact at the Nelson Mandela concert in the 1980s. Here, she’s giving it her best shot. Songs are embellished with bass, drums and echo; there’s even a cover of Nirvana’s Come As You Are. But her best tune sees the acoustic Chapman of old breaking off to angrily hammer at tom-toms. America is her most direct, striking song since Fast Car, dissecting US imperialism with killer lines like, “Your sons and daughters will never sing your praises while you’re conquering, America”. 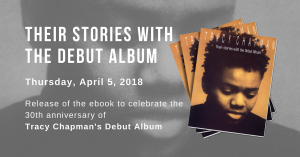 As she segues instantly into Talkin’ Bout a Revolution (“Poor people gonna rise up …”), it will take more than blown fuses to stop Tracy Chapman fighting the power. · At Hammersmith Apollo, London W6, tonight and tomorrow, then touring. Box office: 0870 606 3400.